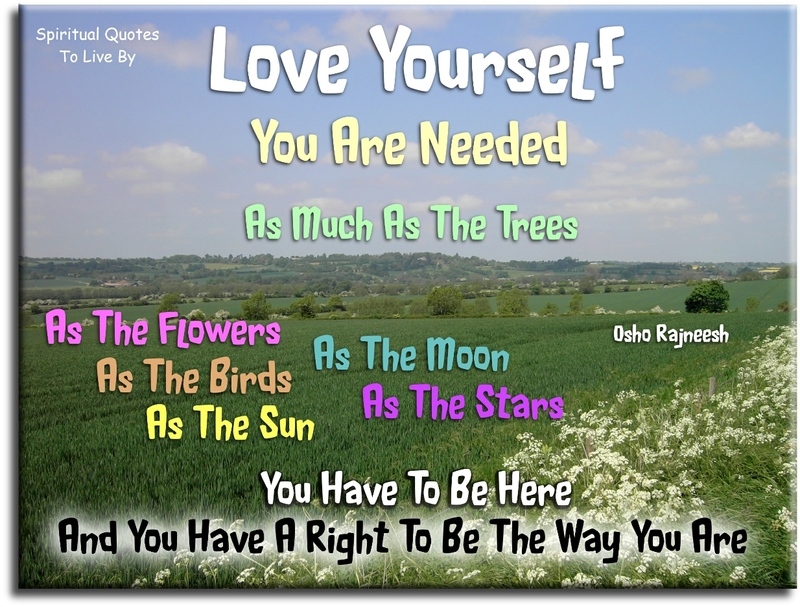 These self love quotes give guidance for what most of us find the hardest thing to do, loving ourselves. Just imagine what confident, happy people we would all be, if we were able to love ourselves, regardless of what we did, how we looked and felt, or what anyone else thought of us. Nobody's perfect, it's okay to be just who you are right now and love that person. Even if you want to change many things about yourself, the first step is to accept yourself now, as you are. Almost no one knows how to love themselves cause you’re running around trying to find other people to love you. Standing on your head in all kinds of different ways. ‘If I’m like this, do you like me?’ ‘If I give you this, will you like me?’ So you lose track of who you are because the more you’re looking to others to love you, the more you’re not in sync with who you are. Give yourself the love you seek, and the universe will send people who match it. If you're not selfish enough to want to feel good, then you can't connect with the energy that is your Source, which does always feel good. I like myself more than ever. I feel so comfortable in my own skin. I really like how I look, I like who I am. I like everyone that I surround myself with. Obviously I have insecurities, but they don’t hold me back. Everything comes down to self love. Long tresses down to the floor can be beautiful, but learn to love what you have. Our first and last love is self love. Love yourself unconditionally, just as you love those closest to you, despite their faults. 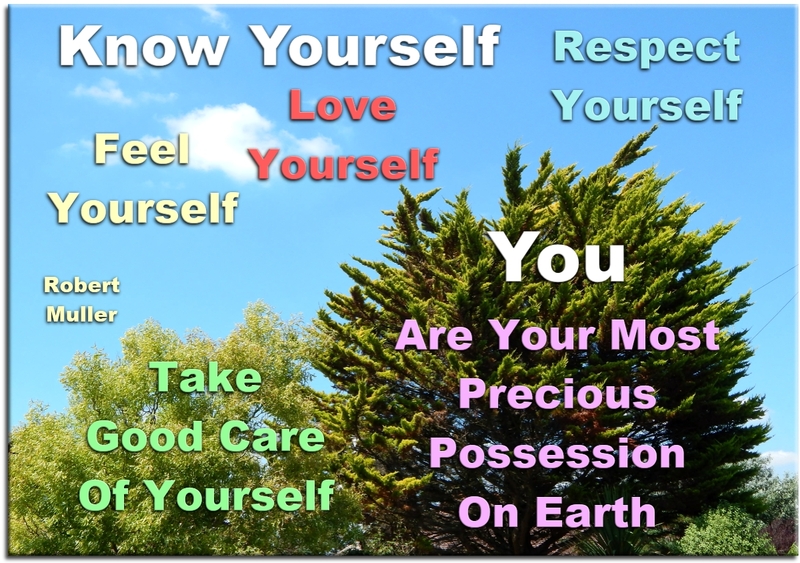 You, yourself, as much as anybody in the entire Universe, deserve you love and affection. If you can love yourself more, you will be able to love others more and you will be more truly yourself. Self love is about valuing and loving who you are. The Angels tell me that loving ourselves is very important for our happiness. As I began to love myself, I found that anguish and emotional suffering are only warning signs that I was living against my own truth. Today, I know, this is Authenticity. As I began to love myself, I stopped craving for a different life, and I could see that everything that surrounded me was inviting me to grow. Today, I call it Maturity. As I began to love myself, I understood that at any circumstance, I am in the right place at the right time, and everything happens at the exactly right moment, so I could be calm. Today, I call it Self-Confidence. As I began to love myself, I quit stealing my own time, and I stopped designing huge projects for the future. Today, I only do what brings me joy and happiness, things I love to do and that make my heart cheer, and I do them in my own way and in my own rhythm. Today, I call it Simplicity. As I began to love myself, I freed myself of anything that is no good for my health - food, people, things, situations and everything that drew me down and away from myself. At first I called this attitude a healthy egoism. Today, I know it is Love of Oneself. As I began to love myself, I quit trying to always be right, and ever since, I was wrong less of the time. Today, I discovered that is Modesty. As I began to love myself, I refused to go on living in the past and worry about the future. Now, I only live for the moment, where Everything is happening. Today, I live each day, day by day, and I call it Fulfilment. As I began to love myself, I recognized that my mind can disturb me and it can make me sick. But, as I connected it to my heart, my mind became a valuable ally. Today, I call this connection Wisdom of the Heart. We no longer need to fear arguments, confrontations or any kind of problems with ourselves or others. Even as stars collide, and out of their crashing new worlds are born. Today, I know.. That is life. Love takes many forms.. It is up to you to choose which you wish to express. Look into a mirror, make eye contact with yourself, and say "I love me" as many times as possible during the day. Give up being perfect for being authentic. Be who you are. Love who you are. Others will too. Life isn’t about wishing you were somewhere, or someone that you’re not. Life is about enjoying where you are, loving who you are and consistently improving on both. The way you treat yourself, sets the standard for others. Love yourself enough to change. Love thyself, so that you can love another. Love thyself so that you cannot project fear. Love thyself so as to let others love you. Love thyself so as to let people near. I found the greatest love of all inside of me. The greatest love of all is easy to achieve, learning to love yourself, it is the greatest love of all. 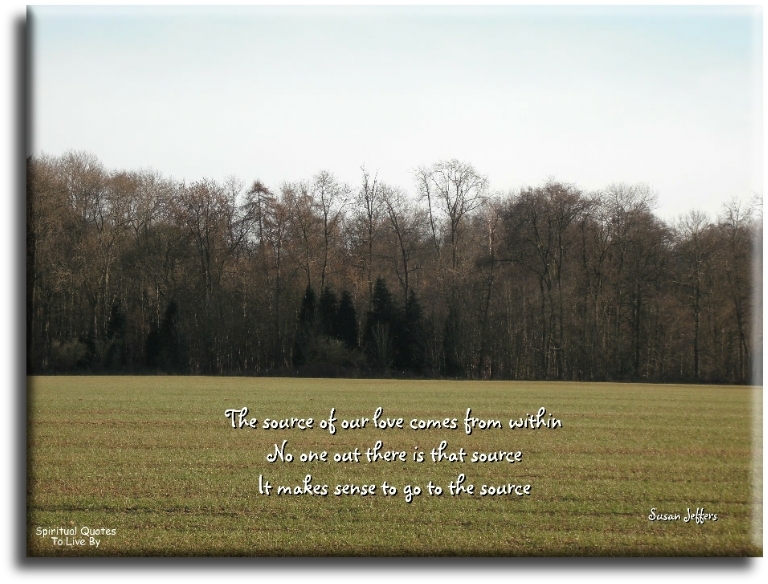 The source of our love comes from within. No one out there is that source. It makes sense to go to the source. You’ve really got to practice loving yourself. The ultimate lesson all of us have to learn is unconditional love, which includes not only others, but ourselves as well. Growing spiritually and consciously includes loving self. You could say that Soul evolvement starts with loving self, you have to know how love feels to you before you can feel love for others and be open to receiving it. Loving self is honouring your Divinity as a part of God. I became my own authority by listening to the wisdom of the heart. This is how God speaks to me. This is intuition. I began to feel a Divine presence in me and hear its guidance. I came to love being alone surrounded by silence awed by its spell, listening to inner space. The inability to love and accept yourself and your humanity is at the heart of many illnesses. To be loved and accepted, you must start by loving yourself. If you have traits that you consider unlovable, you must love them anyway.. It’s a paradox. Your Higher-Self loves you unconditionally. It is time for you to make a commitment to create joy, creativity and love for yourself, only then will you benefit others, for if you do not evolve yourself, you do not serve others. Above the cloud with it's shadow, is the star with it's light. Above all things, reverence thyself. Love yourself. 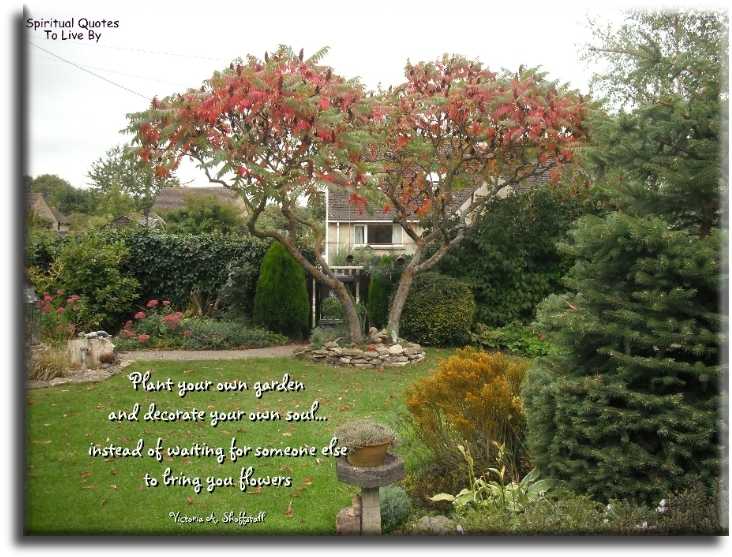 You are needed as much as the trees, as the flowers, as the birds, as the sun, as the moon, as the stars. You have to be here and you have a right to be the way you are. When you look in the mirror and say, ‘I love you,’ don’t worry if you don’t believe it yet. Love is far more powerful than your limiting beliefs. Keep your heart open, for as long as you can, as wide as you can, for others and especially for yourself. You must love yourself, before you love another. By accepting yourself and joyfully being what you are, you fulfill your own abilities, and your simple presence can make others happy. Love yourself first. You can’t pour from an empty vessel. Self love is the instrument of our preservation. There is nothing Madison Avenue can give us that will make us more beautiful women. We are beautiful because God created us that way. Learn to love yourself like no one else will ever do it better… because, no one will. Make a list of 100 things you love about yourself and then laugh because you know whoever isn’t with you, is missing out on so much. Love yourself, for if you don't how can you expect anyone else to love you.